Eyak is an extinct Na-Dené language historically spoken by the Eyak people, indigenous to south-central Alaska, near the mouth of the Copper River. The name Eyak comes from a Chugach Sugpiaq name (Igya'aq) for an Eyak village at the mouth of the Eyak River. It was the first Alaskan language to go extinct in recent history. The closest relatives of Eyak are the Athabaskan languages. The Eyak–Athabaskan group forms a basic division of the Na-Dené language family, the other being Tlingit. Numerous Tlingit place names along the Gulf Coast are derived from names in Eyak; they have obscure or even nonsensical meanings in Tlingit, but oral tradition has maintained many Eyak etymologies. The existence of Eyak-derived Tlingit names along most of the coast towards southeast Alaska is strong evidence that the prehistoric range of Eyak was once far greater than it was at the time of European contact. This confirms both Tlingit and Eyak oral histories of migration throughout the region. The spread of English and suppression of aboriginal languages are not the only reasons for the decline of the Eyak language. The northward migration of the Tlingit people around Yakutat in precontact times encouraged the use of Tlingit rather than Eyak along much of the Pacific Coast of Alaska. Eyak was also under pressure from its neighbors to the west, the Alutiiq people of Prince William Sound, as well as some pressure from the people of the Copper River valley. Eyak and Tlingit culture began to merge along the Gulf Coast, and a number of Eyak-speaking groups were absorbed by the Gulf Coast Tlingit populations. This resulted in the replacement of Eyak by Tlingit among most of the mixed groups after a few generations, as reported in Tlingit oral histories of the area. The month that the article was published, he traveled to Alaska and met with Dr. Michael Krauss, a noted linguist and Professor Emeritus at the University of Alaska Fairbanks. Dr. Krauss assisted Leduey with proper Eyak phonological pronunciation and assigned further instruction in grammar and morphology—including morphemic analyses of traditional Eyak stories. In June 2011, Leduey returned to Alaska to facilitate Eyak language workshops in Anchorage and Cordova. He is now regarded as a fluent speaker, translator, and instructor of Eyak. Despite his fluency, Eyak remains classified as "dormant" as there are no native speakers. On the Expanded Graded Intergenerational Disruption Scale (EGIDS) Eyak is graded a 9 (dormant); the language serves as a reminder of heritage identity for an ethnic community, but no one has more than symbolic proficiency. Currently, Leduey provides instruction and curriculum assistance to the Language Project from France. The Eyak Preservation Council received an Alaska Humanities Forum Grant that enabled them to start a website devoted to the preservation of the Eyak Language. Other funding supports the annual Eyak Culture Camp every August in Cordova. The Project provides countless language resources including immersion workshops, an online dictionary with audio samples, and a set of eLearning lessons, among others. 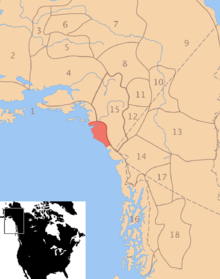 Eyak is a part of the Eyak-Athabaskan language family and Na-Dené larger grouping, which includes Eyak-Athabaskan and Tlingit with a controversial but possible inclusion of Haida. The Athabaskan family covers three distinct geographic areas, forming three subgroups: Northern Athabaskan in Alaska and the Yukon; Pacific Coast Athabaskan in California and Oregon; and Southern Athabaskan, also called Apache, spoken mainly in the American Southwest, which includes Navajo. There has been extensive comparative reconstruction of a Proto-Athabaskan-Eyak (PAE). A recent proposal of a Dené–Yeniseian stock has been widely well received by linguists, linking the Dené languages to the Yeniseian languages of central Siberia. If it proves correct, it will be the first validated genetic link between Old and New World languages. Far less accepted is a possible Dené–Caucasian stock that has been pursued for decades. The following charts are based on the material in Krauss (1965); IPA equivalents are shown in square brackets. The orthography used by Krauss and the Eyak people is the same, substituting only A, L, and X for respective [ə], [ł], and [x̣]. The nasals [n] and [m] occur in loanwords; in native words, Krauss (1965) suggests that they can be interpreted as /l/ and /w/ (respectively) followed by a nasalized vowel. /b/ and /ŋ/ occur only in loanwords. Aspirated stops contrast with unaspirated stops only before vowels. All consonants may be found stem-initially, except /h/, which is interpreted as zero. /h/ has the allophone [h] only word-initially or directly following a vowel. In Krauss's terminology, vowels can be oral or nasal, with further modification by glottalization, aspiration, length, or a combination of glottalization and length. The only unmodified vowels are /i/, /A/ and /u/. Unmodified /A/ varies morphophonemically between [æ] and [e], so /ə/ serves as the basic form of both vowels. When orally modified, the nucleus of /e/ varies between [ɛ] and [æ], the nucleus of /a/ between [a] and [ɔ]. All vowels, regardless of their oral modification, are nasalized following /n/, with the exception of /e/ which is never nasalized. In written Eyak, length is denoted by double letters and glottalization by ’, as in chi:shg "sand" or qi’GA’e’d "bed". All syllables begin with an onset, so that no two vowels may occur consecutively. Syllables can be counted exactly by number of vowels. Eyak is not tonal, unlike many of the Athabascan languages to which it is related; nor does it have distinctive pitch. Stems are heavy syllables, whereas affixes tend to be light. Stress usually falls on stems and heavy syllables. In sequences of heavy syllables, the stress falls on the penultimate syllable, as in q'ahdi'lah "goodbye". Eyak is an agglutinative, polysynthetic language. Preverbals in Eyak are the category of words made up of preverbals and postpositions. The two are grouped together because one morpheme may often be used as the stem in both categories. Preverbals are individual words that occur in conjunction with the verb. These combinations may almost be said to form lexemes, especially due to the fact that preverbals are rarely if ever used in isolation in natural speech. Preverbals are nearly always unbound and are phonologically separate from the verb, contrasting with the corresponding class in Athabaskan which may be incorporated or not. One preverbal is most common, but combinations of two are equally possible, as in ’uya’ ’Adq’Ach’ k’udAdAGu’ "hot water bottle" (in it onto self something/someone is kept warm). There are more than 100 Eyak basic preverbal morphemes. Postpositions relate directly to an object outside of the verb. Current analysis by Krauss has been phonological rather than semantic, but there is at least one semantically grouped category of postpositions to consider, that of comparatives. This grouping includes P-ga’ "like P", P-’u’X "less than P", and P-lAX "more than P" where P is any postpositional phrase. Eyak lacks conjunctions and many postpositions assume a similar function, creating subordinate clauses. These postpositions attach to the verb, the most common example being -da:X "and" or "if, when". Eyak verb stems take many affixes: there are nine prefix positions before the verb (many of which may be subdivided) and four suffix positions after. All positions may be filled with zero, except the stem, which can be filled by any of several hundred morphemes but not zero. The indeterminate is used where there is no specific object (such as in intransitive verbs), while the indefinite is used where there is a specific but unspecified subject or object. 5. Classificatory (nominal) and thematic (verbal) qualifiers: the most variable and characteristically Eyak affix position. gu, XA, lAXA, dA, yA, and lA may occur singly, the rest occur in combinations of two or three. Only in position C. do the morphemes have specified meaning, and only nominally, for example: lAXA, "berry-like, ball-like, eye" or qi: + dA "foot". The other morphemes have unlimited, much broader meanings, but tend to concentrate in certain areas. They may be nominal classificatory or verbal thematic. gu+lA is nominally classificatory and refers to liquid or viscous matter; when gu appears by itself it refers nominally to basket-roots, thread, or hair, (but not rope), as well as thematically with -L-qu, "chase". XA+dA may nominally refer to matches or logs (but not sticks) or to clouds, among others. dA alone thematically refers to an unusually broad selection including but not limited to hunger, sleds, arrows, noises (only certain types), and non-solid round objects (including eggs, severed heads, and hearts). This is a very limited sampling of the breadth of the meanings of the possible morphemes in position 5. Prefix position 1: lAXi:, direct object, you pl. Imperative let it do!, let it become! let it do! let it be! Morphemes in prefix position 2 modify the inceptive imperfective; in position 6 the perfective, optative, and imperative in inceptive, active and neuter; in position 8 the inceptive optative, active perfective and optative, and neuter perfective, imperfective, optative, and imperative; in suffix position 2 the inceptive, active, and neuter perfective; and in suffix position 3, negativity. There are also three derivational modes, a repetitive, a customary, and a progressive. The infinitive takes approximately the same form as the imperative, with some variation. I, introductory sector: consists of two parts, a connective (e.g. 'and so,' 'then,' etc.) and one or more adverbs, especially temporal and spatial adverbs. V, verb sector: includes two subsectors in addition to the verb. C, complement subsector: in Eyak syntax a complement is a noun or noun phrase (e.g. not a demonstrative pronoun) and does not have the same meaning as the usual use of 'complement' in ordinary syntax. This is due to traditional classifications of Eyak. P, preverbal subsector: includes preverbals (preverbs and postpositions) and pronouns. The subject and object categories can consist of a noun, a noun phrase, or a demonstrative phrase. All constituents may be filled by zero, excepting the verb. There is extreme ambiguity in Eyak syntax, due in large part to homophony (as in the English loss of subjunctive) and lack of distinction (there is the same ambiguity in third-person singular as in English). ^ Hammarström, Harald; Forkel, Robert; Haspelmath, Martin, eds. (2017). "Eyak". Glottolog 3.0. Jena, Germany: Max Planck Institute for the Science of Human History. ^ "Last Alaska language speaker dies". BBC News. January 24, 2008. ^ John McWhorter,"No Tears For Dead Tongues" , Forbes,2/21/2008 @ 6:00PM. ^ "Marie Smith". The Economist. February 7, 2008. ^ Hopkins, Kyle. "Extinct Alaska Native language interests French student". Archived from the original on 10 June 2011. Retrieved 15 July 2011. ^ Gibbins, Jennifer. "Preserving Alaska Native culture". Retrieved 15 July 2011. ^ Hintze, Heather (2014-06-25). "Program seeks to revitalize extinct Eyak language". KTVA CBS 11. Retrieved 2014-06-28. Krauss, Michael E. 1965. Eyak: a preliminary report. University of Alaska. Krauss, Michael E. 2004. Athabaskan tone. Pp. 51–136 in Sharon Hargus & Keren Rice (eds) Athabaskan Prosody. (Current Issues in Linguistic Theory 269). Amsterdam: John Benjamins. ISBN 90-272-4783-8. Based on an unpublished manuscript dated 1979. BBC News article about death of last native speaker, with her picture. (Article date January 24, 2008). From Stewards to Shareholders: Eyaks Face Extinction (interview).